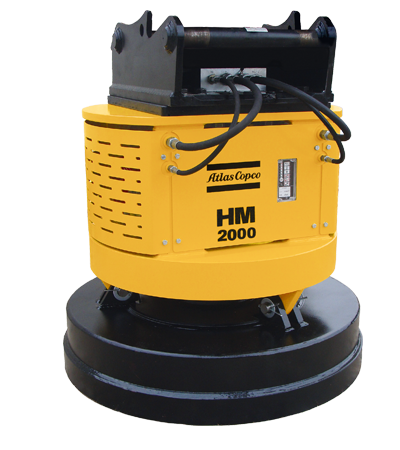 A HM hydro magnet is a highly efficient way of adding magnetic lifting capability to your fleet of hydraulic handlers. The magnet will help you save on equipment repair and down-time; and allow you to turn scrap metal into a profitable income source. A HM hydro magnet attaches easily to any hydraulic carrier and is ideal for demolition sites, scrap yards and recycling facilities. Most demolition waste contains iron and steel. This material is both recyclable and valuable. With our hydro magnet, you can collect this metal quickly and easily – and turn waste into profit. Remove hazards. Prevent damage. Reduce down-time. Scrap metal and rebars lying around on sites can be a safety hazard. The metal may cause flat tires on the trucks and damage to equipment such as crushers and conveyer belts. With our hydro magnet you can collect this scrap metal effectively and protect both your workforce and your equipment. Your site will be safer and cleaner – and you’ll save money on maintenance and repairs.